The SCBTMA will be participating in two upcoming local festivals. The first is DokoFest on Saturday, September 29th at Doko Meadows Park in Blythewood from 11am until 4pm. The second is the Gaston Collard & BBQ Festival on Saturday, October 6th from 10am until 5pm. Admission to both festivals is free. The SCBTMA will have a table with information and t-shirts for sale. Both festivals will have live music, food, and family-friendly fun! We've got another House Concert coming up on November 10th to raise money for our general fund. Entertainment will be provided by member band BACKWATER. The location is the Cayce Museum. Doors open at 2pm, and the show runs from 2:30-4:30pm. Tickets can be purchased for a $10 donation. The Cayce Museum is at 1800 12th Street, Cayce, SC 29033. To Our first House Concert and Youth Scholarship Fundraiser was a great success! Thanks to all who attended, helped, and put this event together! Thanks to Board Member Nathan Speare for this great idea, and thanks to member band, The Picken Pearls, for a fantastic performance! The SCBTMA will be hosting a House Concert on May 12th to raise funds for our Youth Scholarships! The Picken Pearls will be performing with special guest Steve Bland at the Cayce Historical Museum. Doors open at 2pm, and the show runs from 2:30-4:30pm. We'll provide coffee, and you bring a light snack or dessert and your favorite non-alcoholic beverage. Tickets are $10 and must be bought or reserved in advance as seating is limited. Contact Nathan Speare, Lana Brown, or Misty Shotts Harley for tickets or more information. 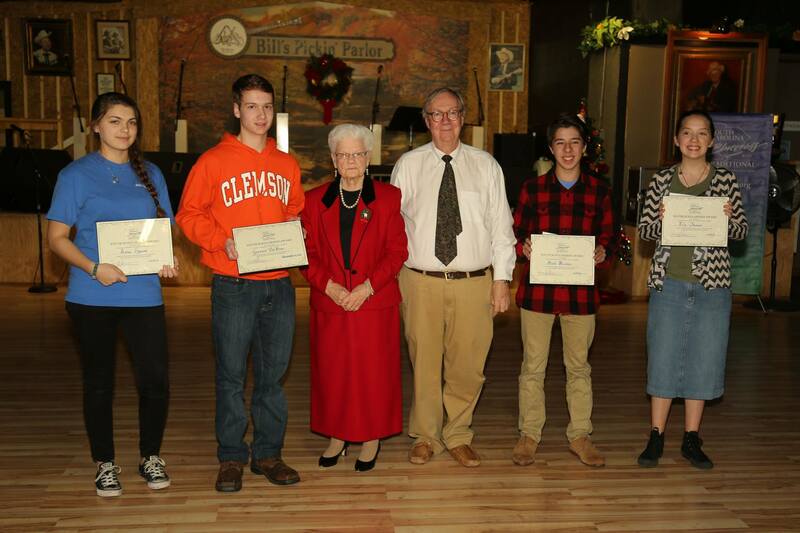 At our last General Meeting of 2017 we awarded three Youth Scholarships to deserving young stringed instrumentalists. The winners were: Hallie Baumgartner, Kay Baumgartner, and Sarah Bradshaw. Congratulations ladies! The SCBTMA Board elected a new President for 2018 following two terms served by Tommy Thomas. Leo Pearson is the new President of the Association. Congratulations to Leo! The next General Meeting will be on Monday, March 19, 2018 at the Backyard Cafe at 940 Old Barnwell Rd, West Columbia, SC 29170. We will have a meeting beginning at 7pm followed by time to eat and jam. We hope to see you! Our September GENERAL MEETING previously scheduled for Monday the 18th has been moved to Monday the 25th. We will meet at 7pm at Vacchios Greek & Italian Bistro & Lounge at 1505 Charleston Highway in West Columbia SC 29169. This will be a short meeting with jamming after. Enjoy a nice dinner or snack while attending! Their phone is (803) 550-9470 if you have any questions about the menu or restaurant. We hope to see you, and bring your instrument! To help us further our goals of preserving, promoting, publicizing, and supporting Bluegrass and traditional music, we are seeking support from businesses willing to donate funds or materials to the SCBTMA. If you have experience in seekign business donations to non-profits and are willing to help out, please contact us! Call Willie at (803) 796-6477. Join member band Willie Wells & The Blue Ridge Mountain Grass as they host the “Roots of Bluegrass” series at the Lexington County Public Library’s South Congaree-Pine Ridge Branch. Each session will discuss various instruments that make up the Bluegrass sound and you’ll be treated to live performances by this very talented group of musicians! Admission is free, and the series is sponsored by the SCBTMA. Each session runs from 5:30-6:30pm. To further our educational mission, we would love to begin doing Bluegrass presentations in schools. If anyone knows of a school or teacher that would be interested in having a Bluegrass demonstration for their students, please contact us with the school or teacher’s name. If you would like to help out in teaching or playing at a school for the SCBTMA, please contact us as well. Call Willie Wells at (803) 796-6477 or email Staci Jones at staci@camryman.org. We are greatly saddened by the recent death of one of our SCBTMA founders, Frank Stover. Frank was invaluable to the Association since its inception in 1991. He was a tireless supporter of both Bill's Music Shop and the SCBTMA over the years, always making time for events and meetings. 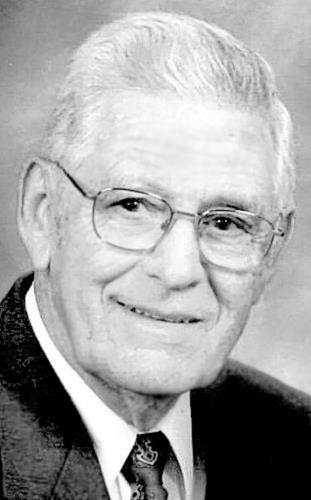 Frank was an active member and Board Advisor right up until his death. We will miss him immensely. Frank passed away on May 20th. Thanks to all who came out to support the Bluegrass Hope Benefit at Bill's Music Shop on March 4th! Over $2,500 was raised to help the victims of the Tennessee wildfires! Thanks to all of the bands who put on a fantastic all-day show, to everyone who donated money and food and supported the efforts, and to those who organized the show and made it happen! 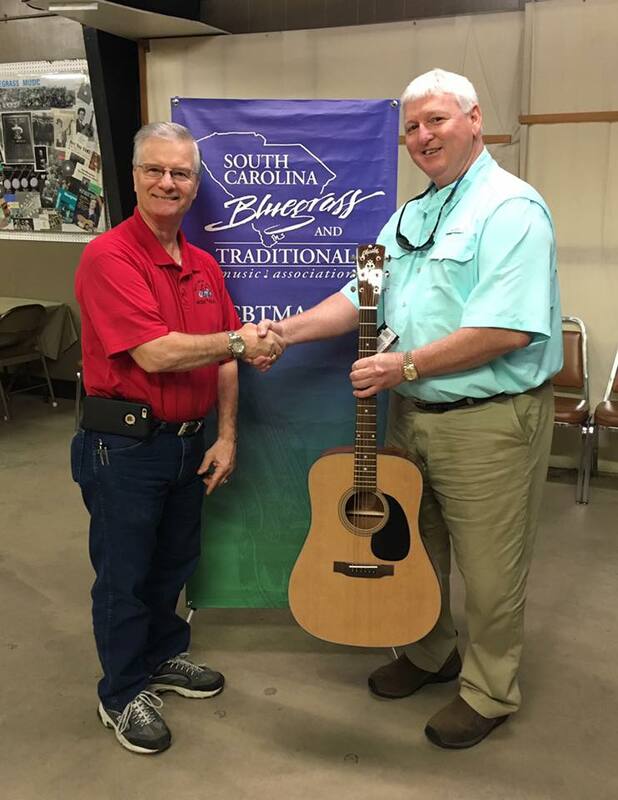 The SCBTMA raffled off a new Blueridge guitar at the Bluegrass Hope Benefit on March 4th. The lucky winner was Steve Jarrett! Congratulations, Steve! It is now time to renew your SCBTMA membership. All memberships follow the calendar year, so as of January 1st, all members are eligible for renewal. Please stop by Bill's Music Shop or print out and return the form below with your dues and help us continue our mission. Help us gain members and you could win a free 2018 membership! Just have your recruited member write "Referred by" and YOUR name on their new membership application. Whoever recruits the most members will win a 2018 membership! A second free 2018 membership will be drawn from the remaining recruiters! We will be placing orders for collared shirts with the SCBTMA logo embroidered on the left chest. 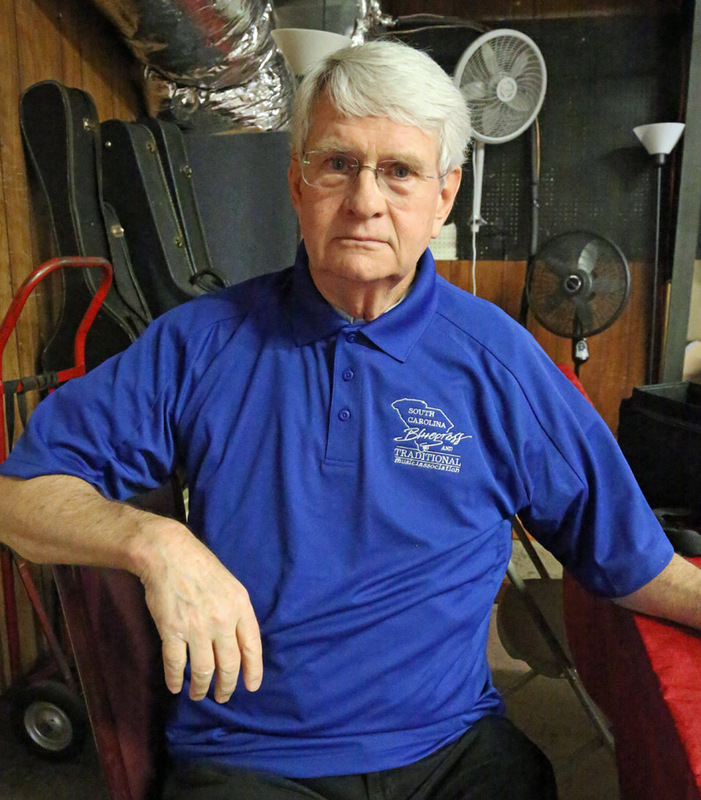 These shirts are high quality polyester polo/golf shirts that are very similar to the Bill's Music Shop embroidered shirts. The shirts will be royal blue with the logo embroidered in silver and come in both men's and women's sizes. Please contact either Willie at Bill's Music Shop (803-796-6477) or Merdick at merdickbrown@yahoo.com to place your order. Shirts are $35 each. Come out to the SC State Museum on Gervais Street in Columbia for a monthly jam session sponsored by the SCBTMA! Jams are held on the last Tuesday of most months from 6-8pm. The general public is welcome, and admission to the jam is free.